PINKNEY, William, a Representative and a Senator from Maryland; born in Annapolis, Md., March 17, 1764; pursued classical studies; studied medicine but did not practice; studied law; admitted to the bar in 1786 and commenced practice in Harford County, Md. ; member of the State constitutional ratification convention in 1788; member, State house of delegates 1789-1792; elected to the Second Congress and served from March 4, 1791, to November of that year, when he resigned due to questions of ineligibility; member, executive council of Maryland 1792-1795; member, State house of delegates 1795; appointed by President George Washington as one of the commissioners to London under the Jay Treaty 1796-1804; attorney general of Maryland 1805; Joint Minister to Great Britain with James Monroe 1806-1807, and Minister Plenipotentiary 1807-1811; returned to Baltimore, Md. 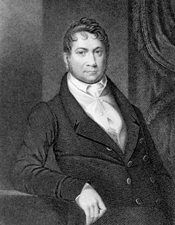 ; appointed Attorney General of the United States in the Cabinet of President James Madison 1811-1814; served as a major in the Maryland militia during the War of 1812 and was wounded at the Battle of Bladensburg, Md., in August 1814; elected to the Fourteenth Congress and served from March 4, 1815, to April 18, 1816, when he resigned to accept the position of Minister Plenipotentiary to Russia, with a special mission to Naples 1816-1818; elected as a Democratic Republican to the United States Senate to fill the vacancy caused by the death of Alexander Contee Hanson and served from December 21, 1819, until his death in Washington, D.C., February 25, 1822; interment in Congressional Cemetery. Dictionary of American Biography; Ireland, Robert. The Legal Career of William Pinkney, 1764-1822. New York: Garland, 1986; Pinkney, William [1810-1883]. Life of William Pinkney. 1853. Reprint. New York: Da Capo Press, 1969.